Jack J. Lew '78, former Secretary of the Treasury and Chief of Staff under President Obama, and Noah R. Feldman '92, a Law School professor, held a discussion about identity, faith, and public responsibility at Harvard Law School. Jack J. Lew ’78, Secretary of the Treasury and White House Chief of Staff under former U.S. President Barack Obama, spoke Wednesday at Harvard Law School about how his Jewish background and beliefs have informed his political pursuits. Lew argued that public servants’ commitment to the nation’s interests should take precedence over their personal religious beliefs. “The sole governing principle for a US public official should be how to best serve the United States and the American people,” regardless of the official’s faith background, he said. While Lew stressed prioritizing American interest over religious beliefs, he also highlighted the role religion can play in politics. His talk formed one in a series given as part of the annual Alan and Elisabeth Doft lectures, which are co-sponsored by Harvard Law School and Harvard’s Center for Jewish Studies. 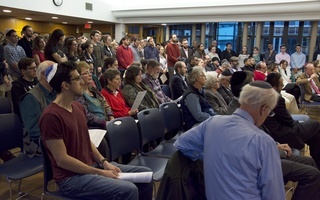 Dozens of Harvard undergraduate and graduate students, University faculty, Cambridge residents, and students from Boston-area colleges attended Lew's speech. Lew said he has often reflected on the relationship between public service and private beliefs over the course of a decades-long career in government. “What I bring is a practical perspective based on many years of balancing responsibility at the highest levels of public service and a private life defined by tradition,” he said. Lew said he melded his Jewish heritage with his political career. He noted that he continued to strictly observe the Jewish holiday of Shabbat while serving in both President Bill Clinton and Obama’s administrations. “Seeking answers always occurs through the lens of the values that define who each of us is,” Lew said. 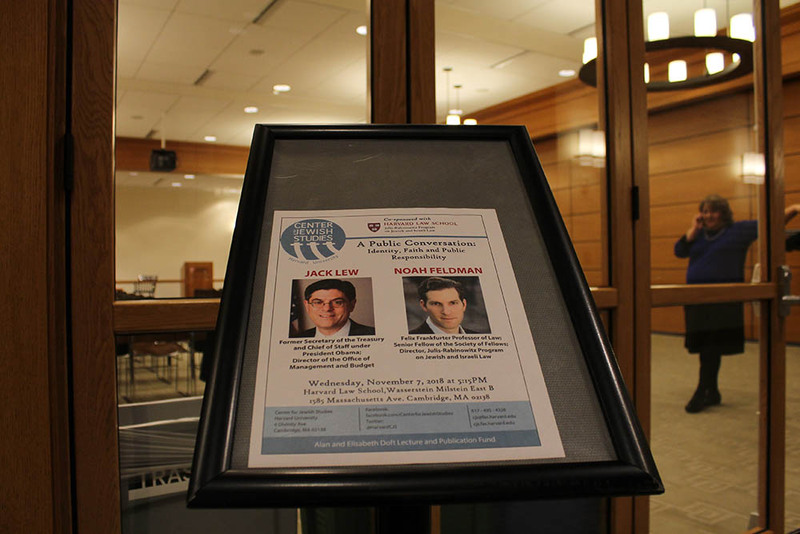 After his lecture, Lew held a public conversation with Law School professor Noah R. Feldman ’92. The two discussed how Democrats and Republicans alike can draw on the same set of religious beliefs when defending their divergent political views. Cambridge resident Mark H. Mulgay, who attended the talk, said he felt encouraged by Lew’s message. Attendee Diane T. Shrenzel, a student at Wellesley, said she agreed. “Hearing about the experiences of someone who worked so closely with the president and who was able to articulate how he managed that not only with his observance but also with his beliefs,” she said. Boris Davidov ’19, another attendee who said he hopes to follow Lew’s example as a Jewish public servant, said he felt inspired by the lecture. He said it was particularly meaningful to hear Lew discuss his Jewish faith with pride in the weeks after a shooting at a Pittsburgh synagogue left 11 dead. This incident is yet another reminder that the irrelevancy of a person’s racial or ethnic background, religious affiliation, sexual orientation, family background, and socioeconomic status must be reaffirmed. 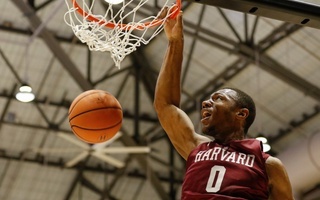 Americans at Harvard and elsewhere, myself included, have a tendency to stop themselves from making logical, intellectually-driven arguments for fear of offending religious people. And this is problematic.